PSCrypt virus is an Ukrainian ransomware that renames data with the .pscrypt extension, continue reading our removal guide to restore your PC and Files. How Does PSCrypt Virus Infiltrate the System? The PSCrypt virus has been found to target commputers in Ukraine, Russia and The Netherlands. Other countries may also be targeted in other campaigns. The primary methods of infection are not a surprise, the hackers use the most popular strategies for spreading viruses to end users. One of them is the use of email spam messages containing social engineering body text. The aim of the criminals is to confuse them by imitating popular companies. The PSCrypt virus is either attached directly or linked in the body contents. The criminals behind the ransomware can also opt to create counterfeit download sites or upload PSCrypt ransomware samples to P2P networks like BitTorrent. All kinds of web redirects, ad networks and dangerous scripts can be used to install the binary files which leads to an active infection. Other attack methods include delivery via browser hijackers or direct hacker attacks. A dangerous new ransomware threat has been identified. It is called the PSCrypt virus and according to the researchers and extracted contents it originates from Ukraine. At the moment the identity of its creator is not known, however we suspect that it is a new hacker as he has not revealed his identity. It may be possible that the PSCrypt virus has been made by a criminal collective as well, as it s code does not seem to contain traces from any of the famous malware families. At the moment the collected samples associated with the PSCrypt ransomware engine show that only a basic encryption module is part of the malware. The virus follows the usual behavior associated with other similar threats by reading a built-in list of target file type extensions. The aim of the hackers is to encrypt as many popular file types as possible: documents, archives, backups, images, music, videos and etc. All of the affected files are renamed with the .pscrypt extension. ВСІ ВАШІ ДАНІ БУЛИ ЗАШІВРОВАННИ! Оплату можна провести в терміналі IBox. за допомогою рядка пошуку знайти сервіс «Btcu.biz». 2. Ввести свій номер телефону. 4. Роздрукувати і зберегти чек. 5. Зайти на сайт btcu.biz. 6. У розділі «Купити» => «За готівку в терміналі» ввести код з чека (підкреслять червоним), ввести капчу, ознайомитися і погодитися з Умовами використання і натиснути кнопку «Оплатити». Переконатися, що код прийнятий і сума збігається з внесеної в термінал. 7. Після того, як код був коректно прийнятий системою, натисніть «Далі» для вибору способу отримання коштів. 8. Виберіть розділ «Поповнити ВТС-адреса», введіть адресу – 1AY8WvyqnHwDSqY2rp3LcE6sYTQkCu9oCY і капчу, натисніть кнопку «Відправити». У листі вкажіть свій особистий ідентифікатор (подивіться на початок цього документа). 10. Після отримання дешифратора і інструкцій, зможете продожам роботу. YOUR FILES ARE TEMPORARILY UNAVAILABLE. ALL YOUR DATA HAS BEEN ENCRYPTED! We can decrypt one file in quality the evidence that we have the decoder. Decoders other users are not compatible with your data, because each user’s unique encryption key. The note reveals details about some of the effects the PSCRypt virus does on the victim computer. It starts with a personal identifier that is assigned to each host. In most cases it is calculated based on gathered system and user data. Unlike other viruses the hackers have not created a distinct payment gateway for the virus. They have opted to blackmail the users with the standard note that advice them to pay the ransomware sum directly in Bitcoins to the given address. 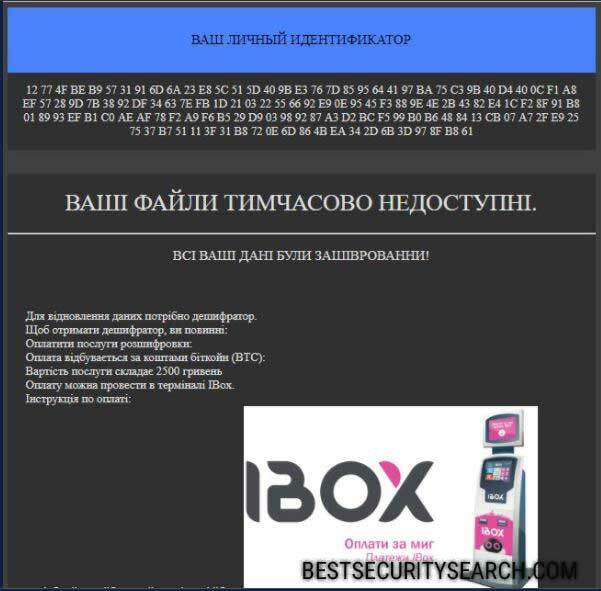 The hackers extort a payment of 2500 Ukrainian hryvnas which is about 100 US Dollars. The money can either be paid via Bitcoins or the iBox system. However the captured samples also feature the payment option of using iBox, a popular solution used in Ukraine. The PSCrypt virus is able to maintain a persistent state of execution by writing data to a remote process. The ransomware engine is able to harvest information about the hardware components of the systems, installed software and related configuration. The virus starts its own process and may spawn additional ones if necessary. The ransomware engine can write files to the desktop configuration file. This is frequently used to hide folders or files during encryption. Several anti-debugging techniques have been used in the process of programming the PSCrypt virus. This allows the hackers to protect the malicious binary from analysis from sandboxing environments, debuggers or virtual machines. The PSCrypt virus has also been found to delete all Shadow Volume Copies found on the computer. This means that the compromised files can only be recovered once the ransomware has been removed with a professional-grade data recovery solution. All computer victims of the PSCrypt ransomware are advised not to pay the hackers and use a quality anti-spyware application to remove the active infection. Follow our removal instructions below. WARNING! Manual removal of PSCrypt Virus requires being familiar with system files and registries. Removing important data accidentally can lead to permanent system damage. If you don’t feel comfortable with manual instructions, download a powerful anti-malware tool that will scan your system for malware and clean it safely for you. WARNING! All files and objects associated with PSCrypt Virus should be removed from the infected PC before any data recovery attempts. Otherwise the virus may encrypt restored files. Furthermore, a backup of all encrypted files stored on external media is highly recommendable.